Chile has partnered up with Mingoville to ensure that all Chilean kids speak English in the future. The national campaign titled “ChileHablaInglés” (Chile speaks English) was launched at a big event July 29th, 2009 in Santiago, Chile with the participation of the Chilean President, Michelle Bachelet. 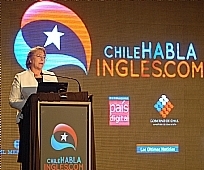 In her speech to the forum of more than 200 influential people from different areas of the Chilean society, the President underpins the necessity of managing English as a second language from an early age and continues that the cooperation with Mingoville in the effort to introduce English to all the Chilean kids makes perfect sense as it is a fun and engaging way for kids to learn English. Besides the President, The Minister of Education, The Minister of Commerce, senators, the US embassy and Chamber of Commerce, other ambassadors, influential business leaders, all large media, academics, sponsors and of course Mingoville participated in the event to take part in securing a bright future for Chile (see more pictures here). The objective of the campaign;”ChileHablaInglés” is to convert Chile into a bilingual country and Mingoville is going to help the Chileans achieve this goal. The campaign is really an interesting case, not only for us but for everybody because it shows that by joining forces across public and private interests, it is possible to substantially raise the educational level of a whole country. We hope that other countries will be inspired by Chile. According to Claudia Bobadilla, Managing Director of the Fundación País Digital – one of the initiators of the national campaign – only 2 % of the total Chilean population speaks English and the language isn’t part of the curriculum until 5th grade because Chile doesn’t have the teaching capacity to offer English earlier on. Studies indicate that Chileans who speak English have a 30% higher income than those who don’t speak it. All parties involved and supporting the campaign acknowledge that in order to raise the living standards of many Chileans and secure the country’s future competitiveness, it is crucial to make sure all Chileans speak English as a second language. This is where Mingoville comes into the scene. The intention is to integrate Mingoville into the Chilean English curriculum already from the first grade and as the interactive English program is designed to fulfill the whole curriculum, it requires less teaching capacity as the kids are capable of learning English by going through the program themselves. All they need is some guidance. According to the Ministry of Education, the goal is to have all public schools use Mingoville as primary teaching material for 1-4 graders and as a supplementary program for the older students. In order to integrate Mingoville properly, the Chilean teachers will be trained on how to use the Mingoville’s digital interactive English program in their curriculum. It requires a different approach to teaching which the Fundación País Digital, VTR and the Ministry of Education – the initiators and sponsors of the campaign – have acknowledged. The primary challenge is to convince the teachers that Mingoville is easy to use and the training courses starting August 7th have been set up to meet the challenge. A massive promotional campaign (CNN Chile, Chanel 13 Chile, El Mercurio, LUN, elvacanudo.cl to mention a few) has been launched to encourage the youngsters as well as their parents and grandparents to register in Mingoville. In the first two weeks, 100.000 Chileans have registered for Mingoville. 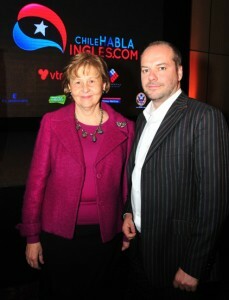 According to País Digital, the www.chilehablaingles.com site has had more than 300.000 visitors already. The interest is huge and everybody is praising of Mingoville and the high quality of its English program for kids. We are proud – we couldn’t get any better recommendation than from the Chilean President and the Ministry of Education, which tested the whole program and fully approved of it. We hope other governments or governmental organizations will be inspired by this remarkable initiative. Mingoville and the “ChileHablaInglés” campaign are just some of the initiatives to fight English illiteracy in Chile. More initiatives will be launched over the next years to come. What is the state of your country? How many speak English as a second language in your country? This entry was posted in Mingoville, Partners and tagged children learn English, Chileans speak English, ChileHablaIngles, kids learn ESL by . Bookmark the permalink. Congratulations :-). That is indeed an amazing accomplishment, I must say! I really look forward to collaborate with you in relation to my research project Educational Cultures and Serious Games on a Global Market Place. Thanks you so much Mikala. We are looking forward to our cooperation as well. See you soon down here..
Hi Mingoville, I’m very proud to know that you’re working with my country (Chile), I’m an English student and I hope to be a contribution to Chile and to all the people who want to learn English. Thanks for believing in my country and working with us to improve our English education. See you bye bye. Hello Mingoville. I’m absolutely happy to see that this initiative is beginning in my country, Chile. I’ve seen with my own eyes how the doors are being opened when you know English. I think it’s very important for all the kids in countries such as Chile, to have the tools to be able to connect with a world that is constantly changing and comes with more challenges everyday. This will also help bring the knowledge to those less fortunate that can’t afford bilingual schools, being accessible to the entire Chilean community. thanks very much ,it’s great web site for learning kids . Quiero practicar ingles hablando non otros por medio de voice chat en mingi ville. Como lo hago?? Hola Diana, no tenemos voice chat porque esta función no se puede moderar y supervisar – sin supervisión no podemos asegurar que los estudiantes hablan solamente en inglés y que usan palabras adecuadas como podemos en el chat de escrito. Pero el juego Quiztalk parece un poco como un voice chat y puedes practicar hablar inglés. Thanks so much I learned some good things by stopping by here this afternoon.